Taught in the heart of Kuala Lumpur, this course will comprise a series of lectures and workshops, that will introduce students to method, theory and practice. Although the focus relates to the course topic, many aspects of theory, method and practice will be relevant and applicable to other aspects of archaeology, human evolution, contemporary art, indigenous studies and even daily life. 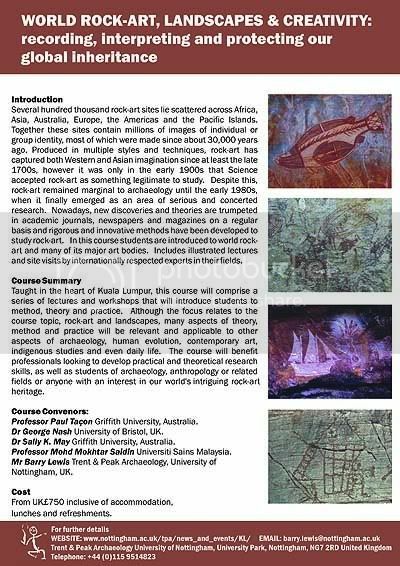 The course will benefit professionals looking to develop practical and theoretical research skills, as well as students of archaeology, anthropology or related fields or anyone with an interest in our world’s intriguing rock-art heritage. The course sounded interesting….. until I saw the cost!! haha, yes… at that price I think it’s a leeeeetle steep for people in this part of the world. Maybe it’s targeted towards the UK students? I would assume its targeted at everyone e.g. Aussies etc, as some of the convenors are from Oz. I guess they may do a package without accommodation for Msians. The big question is……….. will they be able to do anything about preserving Gua Tambun paintings????? Thanks for comments re: the rock-art course. We are trying to find a sponsor to subsidise Malaysian student attendance. If we get enough fee payers from elsewhere in the world then the course can subsidise one or two places for other ASEAN students too. If the course still floats your boat and you are a Malaysian student at a Malysian University then get in touch with me via the web page and I’ll keep you up dated on progress etc. As always with this sort of thing I can’t make promises but we are doing our best.